My father usually refused to talk about the war. But once, over a cup of late-night tea, he did tell me one war story. 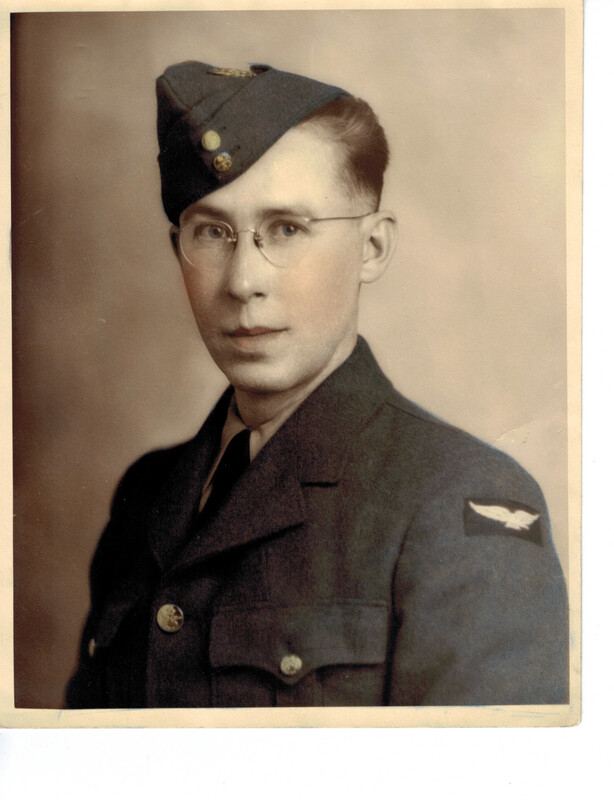 He spent the first years of World War II in Canada, a clerk in the RCAF offices in Halifax. There’s a picture of him in uniform, brandishing a rifle, the Halifax harbour behind him. Then he was moved to England where he again worked at a desk. There’s a picture of him on a golf course in Ireland. Then, as the war was ending, my father was sent to Germany with the occupation forces. He found himself with the liberation army at the gates of Bergen-Belsen. * It was at that point, as the allies won and World War II was over, that my father’s war began. He would never say what it was, specifically, that caused it to happen. Perhaps he looked too long into eyes glazed with hunger and shadowed with pain, eyes belonging to men and women who looked a hundred years old, ‘though they were in their twenties. Perhaps he could not stop staring at the piles of dead bodies, the bones and skulls, or perhaps he was required to record the numbers, the unfathomable numbers. Perhaps he could not bear the smiles of survivors who welcomed their deliverers in silence. He would never say what it was, but something that day, in that place, made my father’s mind stop. It stopped and could not go beyond the horror and the fear. The fear put him on a psychiatric ward in a German hospital. He was afraid to leave it, afraid even to go for a walk beyond the grounds. One day a nurse came with some clothes and told him to get dressed. Thinking they were taking him for a walk in the hospital gardens, he complied. The nurse returned and escorted him out to the front gate. She locked it behind him and, without a word, left him there. The familiar panic attack was immediate, but this time something else rang in my father’s mind. In the midst of his fear he became overwhelmed with the need to find a church. So he started walking. He found one of the huge gothic cathedrals so common in Europe. Though part of it had been destroyed by bombs, he stepped inside and sat down. Above the altar, high stained-glass windows glowed with light. As he stared, they began to move. My dad said he did not know how long he sat there watching, but the entire life of Christ flowed by before him, as though on a movie screen. When it was over, my father was no longer afraid. He returned to the hospital and told them it was time for him to go home. My father’s war story is about a miracle, an event that healed his mind and his soul. In the midst of horror and fear, God was there. Isaiah said it well – “Surely God is my salvation; I will trust and not be afraid. The Lord, the Lord is my strength and my song; he has become my salvation” (Isaiah 12:2). *April 15th, 2015 will be the 70th anniversary of the liberation of Bergen Belsen. My play about my father’s experience, A Pattern in Blue will be part of the Budding Playwrights Festival in Rosebud Alberta in May. An amazing story of God`s healing, Marcia. What an amazing story, Marcia! I felt fear for your father when the nurse walked him through the gate and left him there. I physically felt the miracle of it right in my heart. Our God is mighty to save. Congratulations on making this into a play and finding a place for performance. This story has such a wonderful message.